A Website Affiliate Agreement is made between the “Company” that is the web site owner, and the Affiliate (or the web partner), and collectively, the Parties for participation in the company’s affiliate program. In this, one company agrees to the terms and conditions for involvement and entry in the other company’s affiliate program. The Website Affiliate Agreement is used by lawyers, webmasters, website owners, or affiliates, and is down loadable for your specific usage. This Website Affiliate Agreement document is significant to formalize a mutually profitable and litigation-free relationship between the website owner and the chosen partner. This complete legal document provides and highlights details of the roles and obligations of the website operator and the affiliate throughout the term of the business relationship. 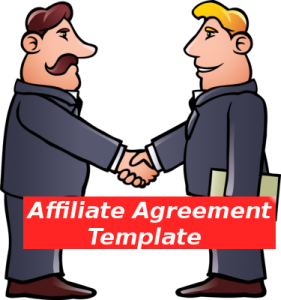 An Affiliate Agreement template is made for those website owners that are determined to run their own affiliate program. These programs use custom designed software or off the shelf packages. They can enable any trading website to pay commission to other websites that deliver customers or leads. In order to ensure that the process and terms are clear to the affiliate websites that will promote your website, ensure that you have a legal Affiliate Agreement published on your site. 1. Webmaster will make available to Affiliate a few banner advertisements, button links, text links and other graphic or textual material for display on the Affiliate website. The Affiliate will display these Materials on his website according to the rules and regulations of the owner. 2. The agreement will be licensed and will expire on its termination. 3. Intellectual Property Owner of the website will maintain all right, ownership, and interest in the Promotional Materials and in any copyright, trademark, or other intellectual property in the Promotional Materials. 4. Relationship of Parties should be made clear. 5. Commissions need to be properly planned. A day to day record should be maintained by both the parties. 6. Affiliate should maintain its given representations and warranties. 7. There has to be a confidentiality contract signed between the two parties which should not be breached. 8. Terms of the contract and agreement should be made clear and legal. 9. Taxes should be paid timely and the owner will not be responsible for any taxes owed by the Affiliate. 10. Limitation of Liability. Company shall not be liable for any loss of profits or costs, or for any direct, indirect, special, incidental or consequential damages, including costs associated with the procurement of substitute goods or services made by the partner. 11. Entire Agreement. The entire agreement made and signed between Company and Affiliate.